weezermonkey: Roy's L.A. Ohana Tour -- $50 Giveaway! There are few chain restaurants that I like. Roy's is one of them. Having worked in Downtown L.A. for over six years, I ate at Roy's fairly frequently and could always rely on the restaurant for consistent high-quality meals. 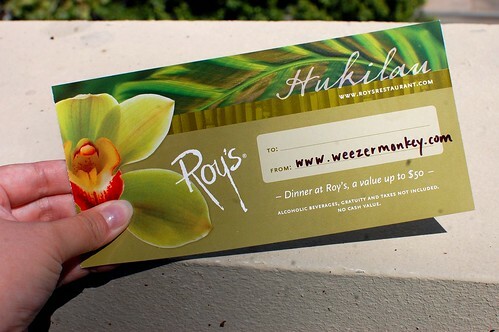 In celebration of Roy's L.A. Ohana Tour, I have a $50 gift certificate to Roy's in Downtown L.A. for one lucky reader! To enter this giveaway, simply comment on this blog post and include an e-mail address, so I may contact you. Roy's L.A. Ohana Tour is a new rewards program designed for diners to experience the creative chef variations on popular menu items offered at each location. From June 9 until August 31, 2010, guests are invited to visit three Southern California Roy's restaurants to receive dining rewards and be entered to win an all-inclusive trip to Hawaii, where guests will enjoy a personal dinner with found chef Roy Yamaguchi. During your first visit to a participating Roy's restaurant, you will get an Ohana Tour card to present at your next Roy's location. On your second visit, you will receive a free chocolate souffle with the purchase of an entree. At your third location, you will get a $20 gift card and entry into the Hawaii sweepstakes. You can read more about the Ohana Tour here. You have through June 30 to comment on this post to be eligible for the $50 gift certificate! I will number the comments and pick a winner through random.org. I will announce the winner on July 1. Again, if I don't already know your e-mail address, please include it in your comment. You can't win if I can't contact you! Also note that this gift certificate is good at Roy's in Downtown L.A. only. Please keep that in mind if you are not a local reader! Thank you so much to Roy's and Allison of Formula PR for sponsoring this giveaway. Awesome! Hook me up! I love Roy's! What a great giveaway! I love Roy's! I've never been to Roy's but I always mean to go. My email address is 10yearstogether AT gmail DOT com. I never win these things but maybe this will be a first. Love the giveaway! I've been wanting to go to Roy's and was thinking about going there for our 2nd wedding anniversary! Is it lame that I never comment, but want to win? :) I heart Roy's! Maybe if I win this I will finally get my act together and head to LA for a long weekend ;-) My email is vitaamoreriso at gmail. is it embarrassing that despite following your blog for quite a while the first time i comment is because there might be free food involved? Ooooh I'd love to try Roy's! oh wow! i love roy's! nice giveaway! ravenouscouple [at] gmail [dot] com thanks! ohhhh Roy's is my FAV!! fingers crossed! I love your blog and i love roys! oooh! i' love to win. coincidentally, we are going to roy's in hawaii next week! it'd be cool to get to try it in hawaii and los angeles! roy's is definitely on my list of favorite chain restaurants. If I win, it is okay if I make a reservation and show up two hours late and high? I like to experience things with the true island essence. Awesome! Sign me up! jenniferel at gmail dot com. Ooh I've never been!! wskp15@gmail.com!!! I Love Roy's! I hope I win! My email is crh612@cox.net. Love Roys! The butterfish is awesome. I rike roy's. Berry much. Sank u.
you know my emailzz ..
Gotta love Roy's - especially the one downtown. I was really impressed with my meal there during DineLA a few years back. feed me! ;) fingers crossed for me! Oh wow - nice! I work so close! If I win, the downtown LA location better have that damn kobe sushi I'm obsessed with. I'd love to try Roy's! I would love to give it a try...I would even travel from Bakersfield for it! I'll cross my fingers!